Breathing a Vein. James Gillray, published by H. Humphrey, St James’s Street, London, January 28, 1804. 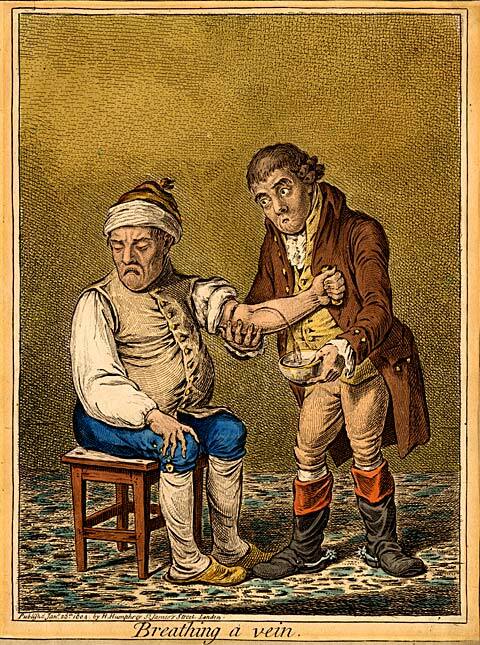 Bloodletting, or phlebotomy, had been a standard medical practice since antiquity. It entailed withdrawing a considerable amount of blood from a person in order to cure disease. Blood was thought to build up in excess and then stagnate in certain areas of the body. Removing the extra blood would restore the natural balance of the body. In this etching Gillray demonstrates venesection, which he calls “breathing a vein.” The title suggests that the procedure was a pleasant way to allow the vein a little air. The reality of the procedure was something else, as the cartoon suggests. A tourniquet was placed above the elbow, the artery in the forearm was punctured by a lancet, and the blood, gushing like a geyser, was captured in a bowl. Gentle Emetic. James Gillray, published by H. Humphrey, 27 St. James’s Street, London, January 26, 1804. An emetic is a medicine that produces nausea and vomiting. “Puking” was considered to be another way to restore balance to the body. In this etching, a man and his physician (both bearing a striking resemblance to the characters in “Breathing a vein”) patiently wait for the effects of an emetic. The physician solicitously holds the man’s head in his hands while the patient looks extremely uncomfortable. A bowl on the table awaits the contents of his stomach. The use of “gentle” in the title is definitely tongue-in-cheek. Taking Physick. James Gillray, published by H. Humphrey, 27 St. James’s Street, London, February 6, 1800. The hand-colored etching, “Taking Physick,” humorously demonstrates the effects of taking laxatives to purge the body of harmful poisons. 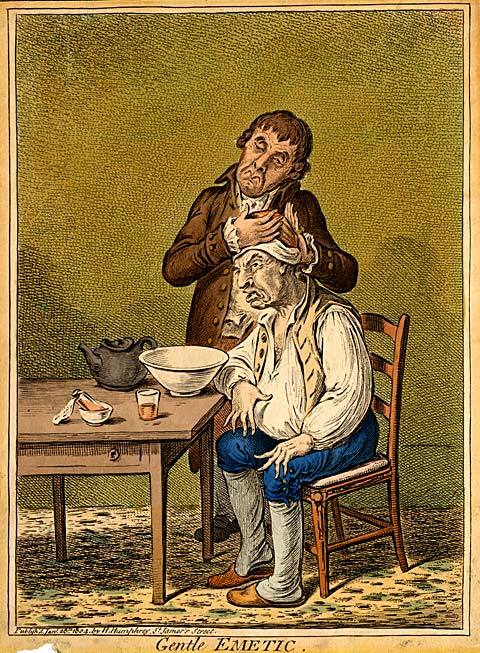 First, the grimace on the man’s face shows that the often bitter, astringent medicinal concoctions were not pleasing to the palate. Second, medicines were not meant to be taken only once, but repeatedly, in order to operate as much as 15 to 20 times. The goal was to completely flush out deleterious material from the system. 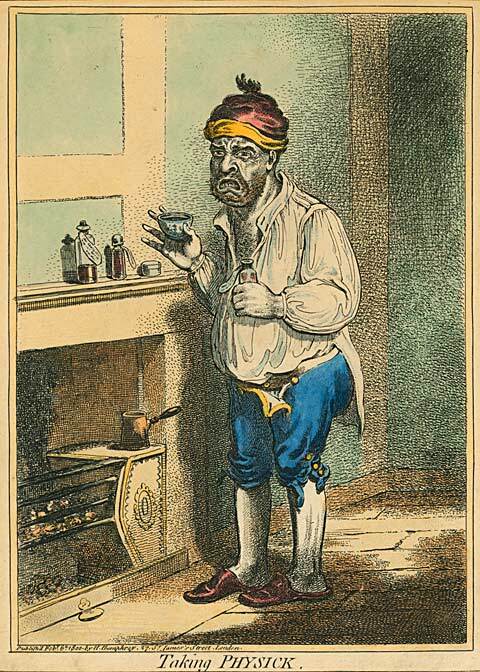 Gillray draws a bottle of medicine in the patient’s hand and also two bottles on the mantle. The man fully experiences the purgative qualities of the medicine. He hasn’t even bothered to tuck in his shirttail or button the fly of his trousers since his last trip to the chamber pot.